Expandable: Add plates/capacity as your business grows. Positive Assembly: The hangers were designed in such a way to make it impossible to insert a plate backwards. Non-Tilt: Unlike many competitors, you do not need to tilt the press on end to load the filter papers. 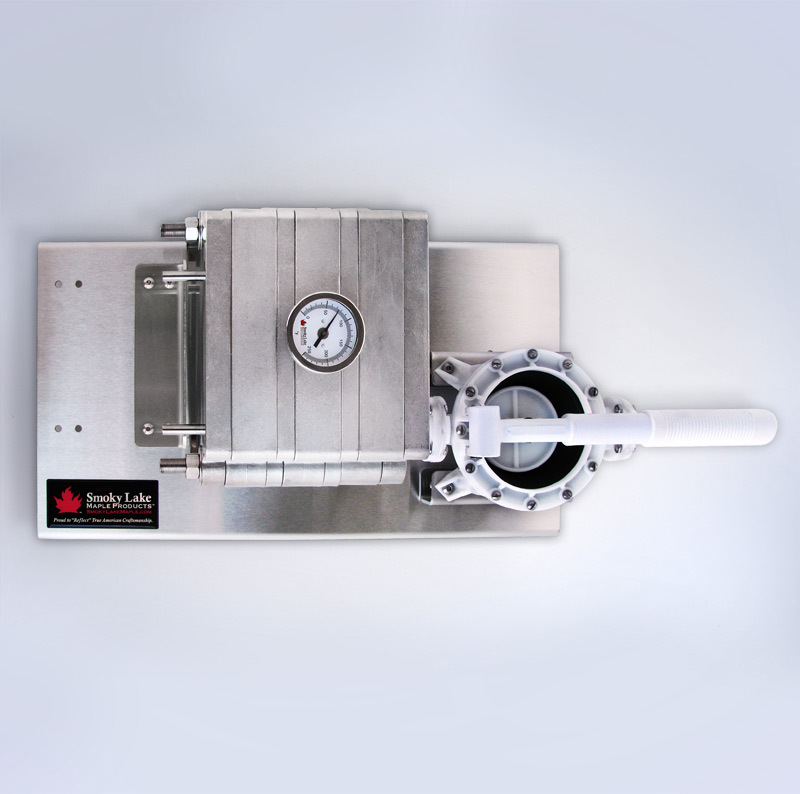 Two Pump Options: Choose from an economical plastic hand pump or a stainless steel air diaphragm pump. Thermometer Option: Tapped into the top of a window plate so you can monitor syrup temperature at startup. Cost will be comparable to our competitor’s aluminum filter presses. See chart at bottom of this page for help with sizing. Smoky Lake is the only manufacturer that offers a window plate fitted with a temperature gauge. This will tell you when the press is warmed up and the syrup coming out is hot enough for bottling. I’ve always wondered why everything in our industry, particularly in the processing, was required to be food grade Stainless Steel; yet none of the filter presses were being built to those standards. A long time ago a representative of one of the major equipment manufacturers told me, “It’s too expensive to build filter presses out of stainless steel”… That’s always bothered me. Over the past year and a half Smoky Lake Maple Products has been exerting great effort into the development of the best filter press in the maple industry. We’ve succeeded. We’ll be offering it for a cost comparable to the aluminum and plastic units currently on the market. We’re very proud of it. The press is 100% Stainless Steel. The frame is stainless steel. The plates are stainless steel. The air diaphragm pump is stainless steel. All fittings and hardware are stainless steel. All 304 Stainless Steel. 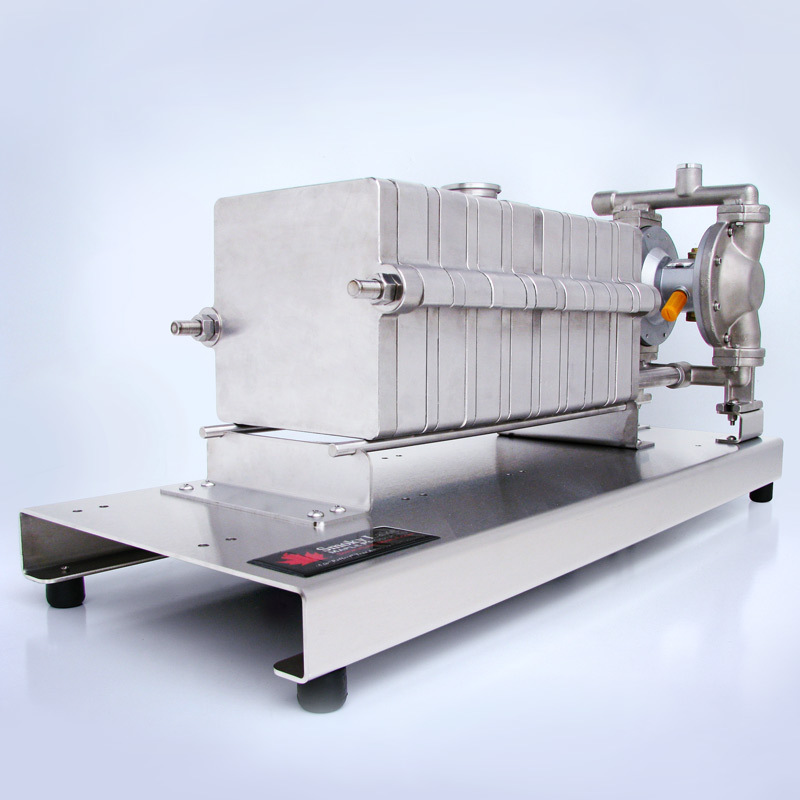 We’ve created the only indisputably food grade filter press in the industry. And it looks as professional and beautiful as the rest of the equipment Smoky Lake has become known for. It’s easy to compare this press against any of the cast aluminum models and see how stunning it’s beauty is. Every unit is built to be expandable. 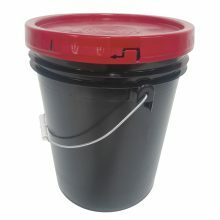 A hobby producer can start with either the small platform or the large platform and chose the optional Hand Operated Plastic pump and load as little as 6 filters at a time. As this hobby producer grows they can expand the unit in increments of 4 filters to a total of 10 on the Small Platform or 20 on the Large Platform. That producer can chose to upgrade to the Stainless Steel Air Diaphragm pump at any time, all mounts and connections are in place and ready for such an eventuality. This system is meant to last a lifetime of syrup production, growing with the producer as they expand their crop. Each window plate will hold 3 – 1/4 cup of DE. Finally it’s literally impossible to put any of the plates in backwards, thanks to the foresight taken to offset the hangers on every piece. 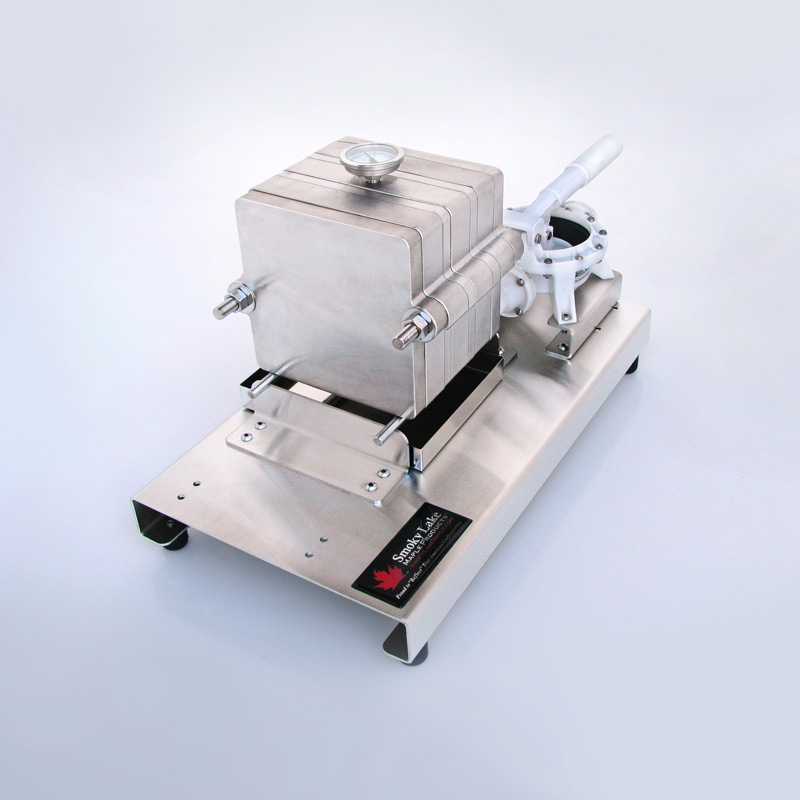 Most experienced producers know how frustrating it is when they accidentally put only one plate in backwards, not going to happen with the new filter press from Smoky Lake Maple Products. With soft start, the flow AND pressure are very easily controlled. You can pump a few tablespoons at a slow, low pressure until you see that everything is correct. Then crank up flow by giving it more air. In contrast, with a gear pump/electric motor, the pressure and flow start immediately/violently because a gear pump is a positive displacement pump. That means that for every revolution of the pump, a defined amount of liquid MUST come out of the pump—every revolution! And the outlet pressure is relatively MUCH higher. Because of this, there is no forgiveness if something is not hooked up correctly or some valve is not set right. As the filter press fills with DE and reduces or stops flowing, it’s very simple to twist the regulator knob up a bit to resume pumping. This can be done at any time, at any flow rate, from stopped to almost wide open. Of course, this is dependent on having an air pressure regulator in-line between the air compressor and the diaphragm pump. If you are pumping filtered syrup into your canner while you are filling small bottles, you can turn the pressure down low and slow. On the other hand, if you are filling barrels or 5 gallon containers, turn up the air and let it rip! A HUGE advantage of air pump versus electric motor pump is that the air pump can remain “stalled” for hours (days!) without harm to your equipment. Try that with an electric motor driven pump! The below chart estimates how much syrup can be filtered in a single session based on the number of filters in your press. In other words, this is how much syrup could be filtered before the press needs to be cleaned. More Filters = Higher Capacity. The actual number of gallons filtered will depend on how much sediment is in your syrup to begin with. Dirtier syrup will clog/fill the press faster. The filter papers do NOT do the filtering. Rather, a natural, powdery, food grade material called diatomaceous earth (DE) does the filtering. The papers only provide a backstop to catch and hold a layer of DE. The DE builds a permeable layer on the papers, and keeps growing or building out as more DE, dirt and syrup are introduced to the press. The DE will hold a certain amount of “dirt” while still allowing flow. If too much dirt is deposited on the surface of the DE, the flow will slow or stop, and pressure will rise. If there is excess DE for the dirt load, syrup will simply flow faster and with less pressure. Many variables will determine how much syrup you can filter before needing to clean out the filters: The amount of dirt or nitre in the syrup, the temperature, the amount of DE being used, etc.The hardest variable to determine is how much dirt is in your syrup. Syrup that has settled for several days doesn’t contain nearly as much dirt as syrup from the bottom of a barrel. Syrup directly off the evaporator contains a dirt load somewhere in between these two extremes. Your press might only be able to filter 1 gallon of “sludge” from the bottom of a barrel, or it could do 20 times that amount if it is fed well-settled syrup. It all depends on the TOTAL amount of dirt in the batch, not on the number of gallons of syrup. How much DE do I need? Each 7” window plate can hold up to 3¼ cup of DE. The press will be “full” when enough DE has entered the press to fill each window plate. When purchasing DE, you must make sure that it is food grade (also sometimes called “human grade”). You will find that it comes in many different particle sizes. Note that a larger particle size can hold more dirt. A 2017 article in Maple Digest suggested that having too fine of a particle size could actually filter out some of the good maple particles and affect flavor. In conclusion, we suggest using the coarsest grade available (For example, 5000 or 4200 Dicalite). It is better to go heavy on the DE on the first two to five quarts of syrup that you run through the press so that you can build a nice layer inside the press. How Much Syrup can I Filter Each Time? Never touch the press with bare hands when it is hot. Wear heavy rubber gloves and safety glasses while operating the press. Inspect all hoses before starting to make sure they are secured and in good condition. Inhalation of DE can be harmful to the lungs. It is recommended to wear a mask over nose and mouth when handling DE. Handling DE may dry out the skin. It is recommended to wear rubber gloves when handling DE. High pressure within the press could potentially cause syrup to unexpectedly squirt out from between the plates. If you are filtering at over 50 psi, throw a towel over the filter press as a precaution. I bought the 7″ short bank filter press, and although the season has not yet begun for me, I wanted to post my initial impressions. First, it is extremely heavy duty. The picture doesn’t give you the full impact of how “beefy” this press is. For me the selling points were the stainless steel construction, temperature probe, reusable filters, and of course the price. I can’t believe shipping is included at this price point. Also, the holes are pre-drilled for the electric diaphragm pump and I can add more plates later if I want to upgrade. 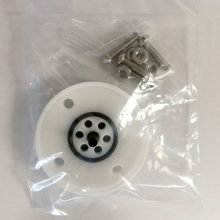 You can really understand why these do have a fairly hefty cost to them when you see the amount of material used in construction as well as the complexity of the machining. I now know why filter presses are not cheap. I will post an update when I actually filter syrup, but for now I give it 5 stars. I’m looking forward to crystal clear syrup and fast filtering. I have the air pump driven 7″ long bank press. It is an amazing unit. I added quick couplers similar to the YouTube video on the Smoky Lake site. It performed flawlessly and is extremely well constructed and easy to assemble. 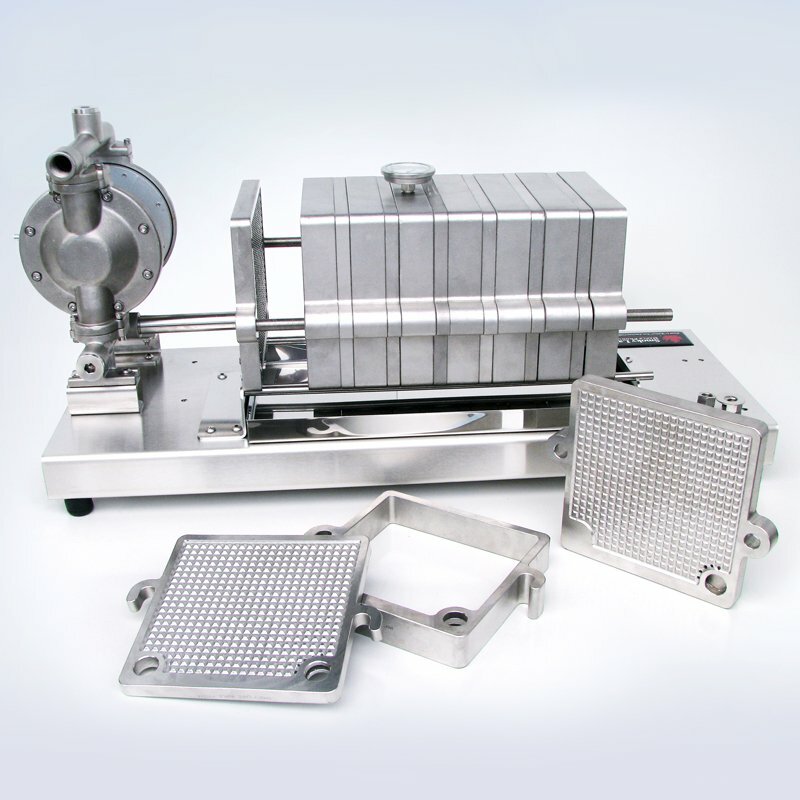 I have owned other filter presses in the past and this unit is superior in quality and design. I am 100% satisfied with this filter and would highly recommend it. Just wanted to let you know that I received the filter press from Smoky Lake Maple Products. I have to tell you I was really impressed with the quality and workmanship – you have done an outstanding job. I know that I won’t be tapping trees for several months, however I took a bunch of last years syrup and ran it through the filter press…I was too excited to wait until I had 2018 syrup…. (the syrup wasn’t totally clear and there was some sediment on the bottoms of the glass bottles.). I poured my syrup back onto the propane finisher, heated it up and added the diatomaceous earth. Stirred it all up, heated the filter press and then ran it through the filter press to get absolutely clear syrup…..the syrup came out the best I have ever seen – way easier (and better quality) than trying to filter through the cone filter! I am extremely impressed with the filter press and can’t thank you enough. I am looking forward to February when I will back out in the forest and tapping trees – thinking about getting that filter press going again! If I could give this less then one star I would. Do not buy this it is just a waste of time and money not to mention syrup. It has been nothing but problems since the day we got it unless you can find the right DE to run through it, which is the stuff that comes with the press when you order it but that is $45 for 12 lbs in a 5 gallon bucket (highest priced stuff out there). We’ve wasted atleast $100 running around and getting different bags of DE. We follow the directions exactly according to the book and it still doesnt work. We’ve called smoky lake and they’ve ran us around with different suggestions and we’ve tried them all but the syrup still comes out cloudy and filled with DE. Over the last seven days we’ve wasted atleast 3-4 pints a day trying to get the press to work which adds up to a lot of money lost and syrup wasted over the short season. I definitely would not recommend this to anybody after all the trouble we have gone through. *Update*. We were finally able to figure out the press. If you follow the directions exactly like the book says you will get very frustrated and upset at how it does not work. Basically just completely disregard the book and you will figure it out and be much happier with the unit. After further research and talking with other producers that use filter presses, just add a cup of DE for every gallon you will be filtering and it works fine. If we wouldn’t known that and ignored the book it would’ve saved us lots of time and money. So I will give it 4 stars now until the book gets updated and the process that is described is corrected and better explained that anybody can get this press and start filtering syrup the right way.